FFA’s December meeting was held on Dec. 12. It included pizza, games and activities, corn-hole tournaments and gift exchanges. 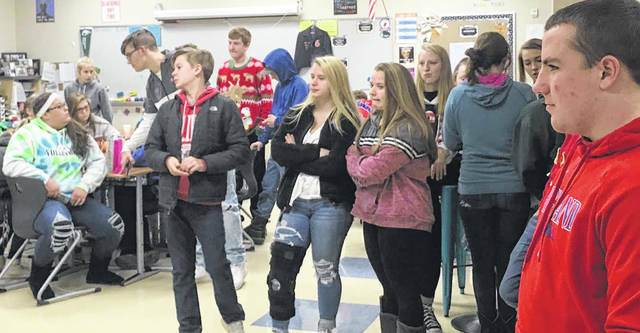 SPARTA — FFA’s December meeting was held on Dec. 12. At this meeting members enjoyed pizza, games and activities, corn-hole tournaments and gift exchanges. We started the evening out with pizza. After everyone had eaten we moved on to the white elephant gift exchange. Members unwrapped, stole, and traded presents until everyone had received one. The officers also had a secret-Santa gift exchange. Later after giving gifts, members played corn-hole and other fun games, talked among one-another and enjoyed each other’s company. We even spent time playing Super Mario Bros on the Wii. For the first time at this meeting, we had an ugly Christmas sweater competition. Those who were voted to have the best-ugly Christmas sweater received a prize. This was definitely a big hit this year and will be a Christmas Party tradition carried down for the next years’ December meetings. Right around the holiday season is when we all need to feel Christmas spirit the most. To help spread this holiday joy, each year Highland FFA members gather with residents of Bennington Glen Nursing Home. After greeting the residents we do a Christmas craft with them and talk with them about some of their favorite Christmas memories. We hope that the company and joy we bring them helps them to have a merrier Christmas.